Hotel complex Les Magnolias is an all-inclusive hotel with a unique location between lush forests and sandy beaches, just 2 km away from the town of Primorsko in southern direction. I prefer Romanian resorts like Mamaia. Romania is much more civilized. 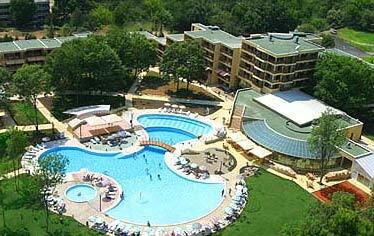 you're all stupid people,the hotel is number 1,and the bulgarians are very good people,but unhappy of the crise econom. in BG c'est un pays francophone but BG DIDN'T SEPARATE THE PEOPLES ,FRENCH OR NOT FRENCH ,bulgarians like all the EUROPE PEOPLE!!! Bulgaria is a PIT people! Trust me on this, don't visit this country! Wouldn't even call it a 'country'. Bulgarians are the scum of the earth, they enjoy torturing and murdering stray animals, there are numerous pick-pockets along the seacoast and their resorts are a pit! I was in Primorsko with my husbant at "Les Magnolias" last year in september ( was a perfect weather), and everything was sa great. The service, the food, a very beautyfull pool and pleasant rooms. THIS IS NOT TRUE : "the constant blasting music was unbearable. The French tour operators were always screaming into microphones, and turning up the music at the pool, so much so that I could not hear what my friend was saying, standing right next to me! When we asked them to turn it down they either refused or made faces and were very rude. At night the discos made it impossible to open the balcony windows. Even with the windows closed, the music kept us awake til 3 or 4 in the morning. We had to buy ear plugs to sleep." !!!!!! There is so much silence, and the rooms are made in a way that you don't hear nothing from outside, aair conditioaned, tv, bathroom, all in room clean, exelent services, great people, place to play golf, parking places, tenis place, at the reception of the hotel a bar where you can whatch tv, snoke and drink whatever you want, very elegant, and places with games and internet cafe, bar for outside, shops, restaurant with buffet where you can eat how much you want, with artistic programs very beautifull, enough food for all, and for breakfast, lunch and dinner. ALSO THERE IS NOT TRUE THIS : "It was mostly run by French people, and if you were a guest, and not French, you could expect to be treated like the scum of the earth" !!!!!. It is true that there are severall groups of tourits wich come for health good in this place, but is not true that if you are not one of them you are bad treated! We enjoyed to stay there for 10 days and want to come back as soon as we can! Ah! The prices are very good and ok! Please dont hesitate to chose this wonderfull place, and by the way, everything looks just like in the pictures! It is amasing! I'm just back from 2 weeks in this hotel and I must say I did not enjoy it, not a bit. Although the hotel is attractive enough, with a nice pool and pleasant rooms, the constant blasting music was unbearable. The French tour operators were always screaming into microphones, and turning up the music at the pool, so much so that I could not hear what my friend was saying, standing right next to me! When we asked them to turn it down they either refused or made faces and were very rude. At night the discos made it impossible to open the balcony windows. Even with the windows closed, the music kept us awake til 3 or 4 in the morning. We had to buy ear plugs to sleep. The food in the restaurant was frequently inedible, especially vegetables. The salad bar was nice, although always the same, but the hot food was terrible. The buffet had always the same pork sausages, pork dishes, cheap chicken dishes, and eggs. Once a week is a "folklore" evening and a roast lamb is served- unfortunately it's gone within 20 minutes and the rest of the guests get- pork. The kids finally would only eat spagetti, until even that was inedible. There was one evening when several of the serving dishes stayed empty throughout the service, making even less choice of food. On several occasions the waiters didn't clear the tables and people arriving to eat a little later than the opening time could not find one table cleared off to eat on. I looked around and all I could see was dirty dishes. I have to admit that after I complained about it this situation got better. Between the bad food and the constant noise problem this was a most uncomfortable holiday. We have been to ClubMeds and other, and this one is really a very high level: very good food, very nice hotel and pool, excellent health care / balneo center and activities (disco, stretching, step, ...). We hope to come back to it as soon as possible ! Absolutely the worst hotel and service from a "4 star" resort I have ever recieved. It was mostly run by French people, and if you were a guest, and not French, you could expect to be treated like the scum of the earth. I would not recommend this hotel to anyone, unless you are looking to waist a lot of money. There were plenty of other resorts in the same area that I'm sure would have provided better service, and would not discriminate.